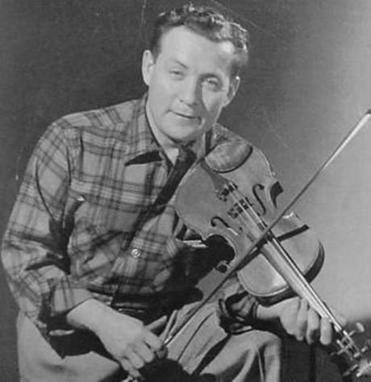 Today, Dec. 4, would have been the 100th birthday of a French-Canadian icon, fiddler Jean Carignan (1916-88). He first learned the violin from his father, an amateur — who relented in the face of his son’s obstinate fascination with the instrument — and later studied with the Quebecois player Joseph Allard. But Carignan’s real education was technological: the wealth of folk music records released between the World Wars, not just by Quebecois masters, but also Scottish fiddler James Scott Skinner and, especially, legendary Irish-American player Michael Coleman. In addition, Carignan (who regretted being too poor for conservatory training) studied great classical soloists; Jascha Heifetz was a particular idol. Carignan never learned to read music, instead analyzing and memorizing records by ear, internalizing thousands of tunes. Much of Carignan’s career was decidedly local, in dance halls that were the music’s natural habitat. But even after headlining large folk festivals, Carignan, to his chagrin, still needed day jobs to make ends meet, working as a shoemaker, in construction, and as a taxi driver. His own recorded legacy, tellingly, was almost entirely produced by companies outside Canada, most notably a series of releases by the Vermont-based Philo label.